With blueberries in abundance at the moment (in North America), I couldn’t resist overusing them in this simple cornbread muffin recipe, using both almond flour and coconut flour. I have a recipe for blueberry corn muffins, using corn flour. It’s not grain-free, but readers have asked me to keep it live, so I’ve left it so. And you may be familiar with this no-corn cornbread recipe, which I used to guide me a bit with this recipe. I tried silicone baking cups for the first time, and I’m happy to report that they worked out well. As I thought would happen, the muffins were easy to get out of the liners and looked perfect. The cups are fairly easy to clean, and my last test will be the dishwasher. And how long they last. I used coconut milk, but another dairy-free milk or yogurt will work as well. And if you prefer, maple syrup works also. I haven't tried frozen berries yet, but I'm guessing they'll work. Also, I love lots of blueberries so I go up to 1 cup of berries. I save a handful to put on the top after I've placed the batter in the muffin liners. Also, keep in mind, the wetness and amount of the berries will affect the moisture in the muffin. For mixing the batter, I use a food processor, but if you don't have one you can use a bowl and spoon, mixer, or blender. Add liners to a baking pan. Add the almond flour, coconut flour, salt and baking soda to a food processor and pulse a few times to blend. Or use a blender, mixer, or bowl and spoon. Add the eggs, oil, honey, and milk, and pulse a few times. Rest the batter for a few minutes to let the coconut flour absorb the moisture. Add the batter to the baking pan and bake for 30 minutes, or until the tops begin to brown and a toothpick inserted in a muffin comes out clean. Cool and serve. Store covered for a few days at room temperature, or for a few weeks in the refrigerator. Whenever I see “coconut milk” in a recipe, I never know if it’s the canned variety or what comes in a carton. They are very, very different. Can you elaborate on which one you used? I want to make these muffins this weekend! Thank you! Do you use the coconut milk in a carton or can? I don’t see corn in the muffins. 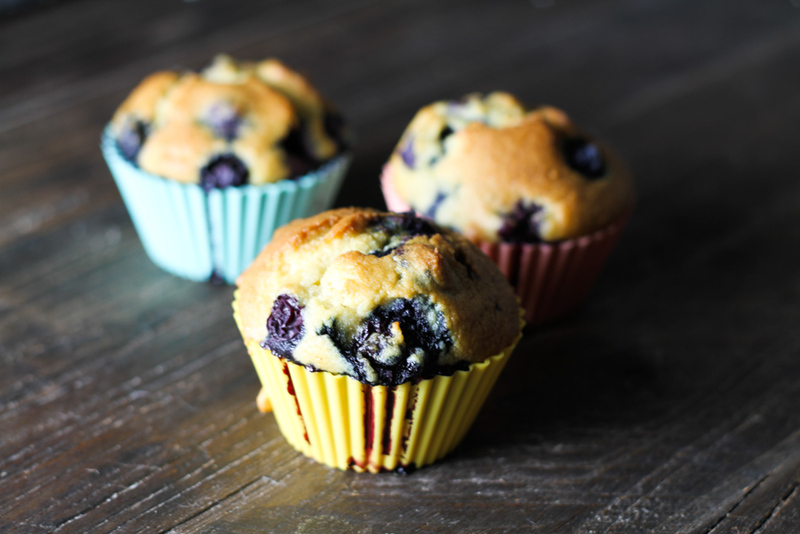 Why are they called Corn Blueberry Muffins? Are these measurements correct? 1/2 cup almond flour and 1/4 cup coconut flour does not seem like very much compared to the amount of liquid in the recipe.